When I arrived in Washington D.C., I thought I had a clear understanding of what I was about to do until I approached the convention center. I had already been given a heads up that the American Academy of Dermatology’s Annual Meeting was taking place in a convention center that was two city blocks in size. I really didn’t think the meeting would consume both buildings, but it really did! After registration, I just kind of walked around in awe. As a patient, I had no idea that these kinds of events existed but now I realize they kind of make sense. If you’re going to pull doctors away from patients, then you should probably make it worth the time. The AAD’s Annual Meeting was an intense 4-day schedule with multiple panels running all days at various times. I don’t know what the attendance records were, but it felt like there were thousands of medical professionals, doctors, students and researchers. I arrived on Saturday, prepared to speak at a panel on Hidradenitis Suppurativa on Monday. From the moment I was asked to do this my stomach was in knots, but I was really determined so I came prepared with strategies to overcome the nerves. I had been given an amazing opportunity to share my story with a room full of doctors. I was confident in my message, practiced a million times and came prepared to deliver. Once in a lifetime I thought, would a patient have this kind of exposure to the medical community. I really didn’t want to mess it up. All I had to do was get up there and speak my truth. I had a perfectly good speech saved on my laptop and would have been fine if I’d repeated that, but I really wanted to offer something that my audience might not have heard in their offices before. So, I decided to focus the bulk of my speech on the road to my first dermatologist appointment. If you’re a patient, then you’ve more than likely had a long road to diagnosis.That long journey had beaten my spirit and I was mostly focused on being afraid of this doctor confirming the worst of what I’d read on the dreaded internet. I wish I had been brave enough to give him that history on my first visit but I couldn’t find the words. So for this speech, I found them. I shared with them that at 21 I had a humiliating experience with a surgeon who told me that my hygiene was poor and that I needed to take better care of myself in order to keep abscesses from coming back. And that I believed him and proceeded to blame myself for years as this disease progressed. How I couldn’t admit to anyone that this was happening because I didn’t want people to think I was dirty. And then, because I was afforded 10 whole minutes, I spoke about that weird time in between diagnosis and dermatologist. Patients can surely relate! When all you have is Dr. Google as your guide while you wait 3 months to get into a dermatologist. I almost hated having an answer more than not knowing. I told my audience that I had members of my most trusted inner circle googling this disease and then suggesting I quit smoking and lose weight. I was an absolute wreck as I walked into my dermatologist appointment. I needed so much help and I just didn’t know how to ask for it. I concluded my time by sharing with my audience how a referral to dermatology research really changed things for me. The researchers were so kind to me, every single one of them. It was the first time I’d ever been in such an open and accepting environment. Because I’d trusted them, I was able to let my guard down and explore all the damage this disease had done. I cried several times writing this. It was so therapeutic to work through this in words. I had put so much of those tears into my speech. All I had left to do was get it to translate. I had a day and a half to familiarize myself with the environment, practice and take advantage of the meeting itself. I sat in for a few medical sessions on acne and walked around the exhibitor hall. On Sunday night, the HS Foundation hosted an event that I was invited to attend. It was there I was honored to meet Dr. Wayne Gulliver. For those of you who don’t know, Dr. Gulliver just won an award in Poland for his research on Hidradenitis Suppurativa. As we spoke, he explained to me that this disease is really starting to get attention and that interest is growing. He seemed so hopeful and positive about the future of HS. His optimism was such a stark contrast to the world in which most of us live. But in his words and because of his work, there was hope. My next conversation at that event was with three medical students who were focusing their studies on HS. We engaged in conversation for quite some time about various topics from pain management to social media, patient needs and where the focus on education should be. These young students, so eager to join the fight, were engaging a patient and treating me with such respect. These future doctors, who will one day treat the next generation are already compassionate, determined, brilliant and understanding. By the time Monday morning came I was ready. The session was a three hour panel on HS entitled HS/Acne Inversa Current Medical and Surgical Management. The room was packed. Two hundred or so people filled the seats. I was prepared to speak but surprised at how emotional I had become right before. I was the fifth speaker on the panel, and I was so just so taken aback by the moment. The doctors before me proceeded to educate their peers in the latest advances in surgical techniques, current pathologies and comorbidities. Attendees were educated on the social media movements taking place, the benefits of support groups and the importance of addressing mental health. They learned about actual patient needs. Places like this exist, I happily thought. People are showing up to get educated about this disease. By the time it was my turn, my nerves were all but gone and I was eager to put into life the words the doctors before me described. It was such a moment in time, for all of us, as I stood up there and recalled a painful part of my past that I’d worked so hard to forget. I had done it hoping to make an impact and I am pleased to report that I succeeded. In a moment forever etched in my mind, at the conclusion of my speech I received a standing ovation. A standing ovation from doctors and students, researchers and medical professionals. For all patients, they’d just heard the pain in our story and got on their feet to applaud us. They heard us. A room full of people who have the potential to change our lives, heard our pain and acknowledged it. The panel continued and more topics such as surgical advances and pain management were covered. At one point, a surgeon got up on stage and taught dermatologists how to communicate with surgeons! So many highlights. Such a moment for HS. Its really starting to happen. Event by event, the awareness is growing. Patients have taken an active lead and there is a growing list of dermatologists and researchers who are committed to doing the same. I want to thank Dr. Michelle Lowes and everyone involved in getting me up on that stage for an amazing opportunity to help shine a light on this disease. It is my hope that more patients become aware of the work that doctors like her and so many others are doing to advance our cause. They’ve listened to their patients and they want to help us! If you’re a patient reading this, it’s important to know the work is being done. When you’ve been so treated so poorly it’s hard to trust any doctor, I get it. But I assure you there are brilliant minds working on this. I have Hope for HS and after reading this, I hope you do too. 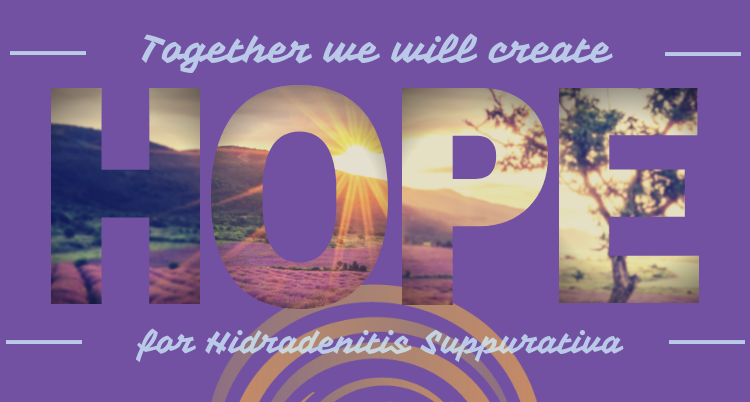 Athena is a wife and patient living with Hidradenitis Suppurativa for over 15 years. She is the patient lead of the Hershey Chapter of Hope for HS. Her hope is to reduce the stigmas surrounding HS so that patients can get the help they need. Crikey. That was an exciting and emotional read. Thanks Athena!